Photograph by Mendel Grosman of a drawing of Mordechai Chaim Rumkowski. 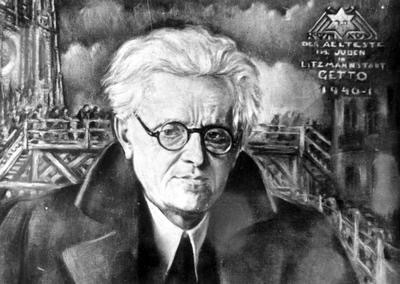 Artist not identified, but quite possibly Lejzerowicz, to judge by similar drawings of Rumkowski’s face. Seems to be the upper portion of the full portrait of Rumkowski documented in USHMM photo 02687. Yad Vashem Photo Archives, 4062/44. Album FA260/A44. Collection of photographs by Mendel Grosman and his asst Aryeh Ben Menachem. Also Ghetto Fighters’ House Photo Archives 1639.